Yep, I just watched Yasmin Ahmad's movie and it was entertaining..Kinda bring back old memories when I was just a small kid (have I ever grow up? )..The setting, the familiar conversation...I saw myself in that movie but my story is quite different.. But suddenly one day, my adopted brother (u know, abang angkat, and he chose me to be his adik angkat and I didn't know why. He was in the same class as my so-called "Mukhsin") sent me a letter. It was normal for him to send me letters but this time, he asked me to meet him at the back of his house at nite, and told me someone wanted to see me.I was afraid. He lived closed to my house but meeting him at nite? I was only 10. My father will kill me for that. So, I wrote him a letter, explaining that I would not be able to do that. I'm not gonna tell u the details of the letter since it still embarrased me till now. I was just a kid, wrote stupid stuffs and I thought it was ok then...and to my horror, the next day, while walking to my school, I saw my adopted brother read the letter with "Mukhsin". 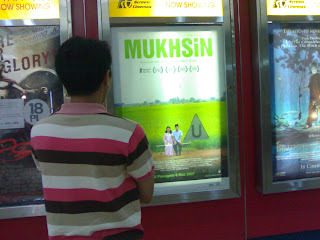 They were actually laughing their heart out...Arghhh..it was Mukhsin who wanted to see me?? I thought that it was gonna end up there. Never it crossed my mind that guy actually has any feelings toward me...But one day, few years after that incident, while waiting alone for the bus to town, he came to me and wanted to chat with me..I just couldn't bring myself to even talk to him...So, I left, the moment he wanted to sit next to me. Yeah..people might be asking reasoning on my action. I just didn't know.I was just a kid, I don't understand to love anyone other than my parents.